Zin! Zin! Zin!...A violin! A violin! A violin! Bach. Mondonville. Strauss. Zeitlin. Spivakovsky. And the females...Pommereul. Jourdan-Morhange. Astruc. Luzzato. Kozolupova. She stands among this league of brilliant and ingenious musicians. She is still young...and small...yes. But, she has had an ear for music from long before she was born. When she was inside the womb, her mummy would often feel the vigorous feet and shifting that occurred when music was around. At the age of 4 months, when she attended mommy-and-me music class, her teacher was impressed that a baby that small could wave her arms and bounce her feet to the rhythm of beats. At the age of one, another music teacher was surprised to see that a young toddler could shake instruments to the beat of the tunes. At the age of two, music teachers would approach her parents and tell them that they think she has an innate talent and a natural love for music and they would encourage the parents to continue nurturing this inclination. Now, at the age of 4, Mirette is a prodigy...a work of nature, in the making. Her name is Mirette Petit, born into a family with no musical talents or even exposure. Mirette knows no better. She's a toddler, just like any other toddler...playful, imaginative, fussy at times, cries, laughs, giggles at the simplest wonders. On the surface, she's really just like any other ordinary child. But, at the age of 30 months, her extraordinary talent revealed itself when she picked up a violin and imitated the teacher by playing "Twinkle, Twinkle Little Star." Her parents and her teacher were so overwhelmed with surprise. They didn't know what was happening before their eyes. At home she would ask for music...all the time. After the introduction to instruments, she would ask to play with an instrument...all the time. Soon after this, at the age of three, her parents bought her her very first violin. 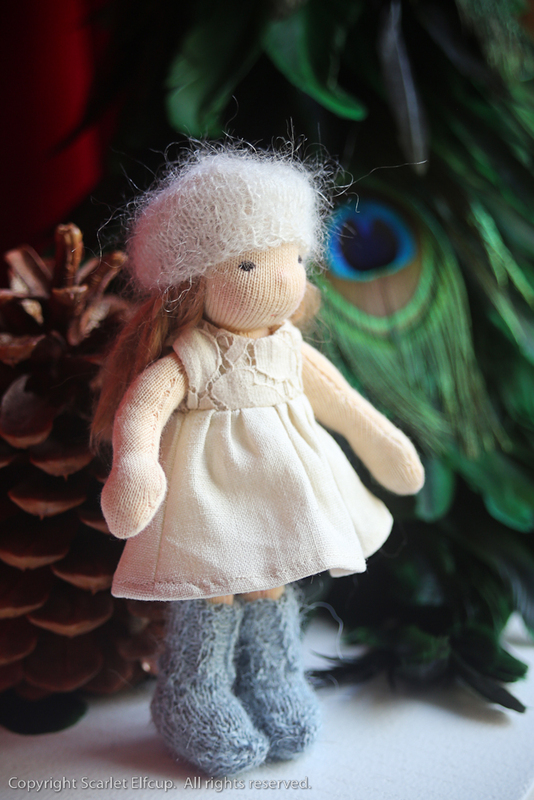 And here she is today, at the age of 4...making her first Christmas solo debut on stage. This is not the first time Mirette has played solo on stage, it's her very first Christmas concert and she is so excited. Mirette, though she's only 4, has a very talented and opinionated mind. She has a little blue coat that her mummy made her for her 3rd birthday (because she loved blue ever since time unknown). She LOVES her little blue coat and she wears her little blue coat EVERYWHERE. 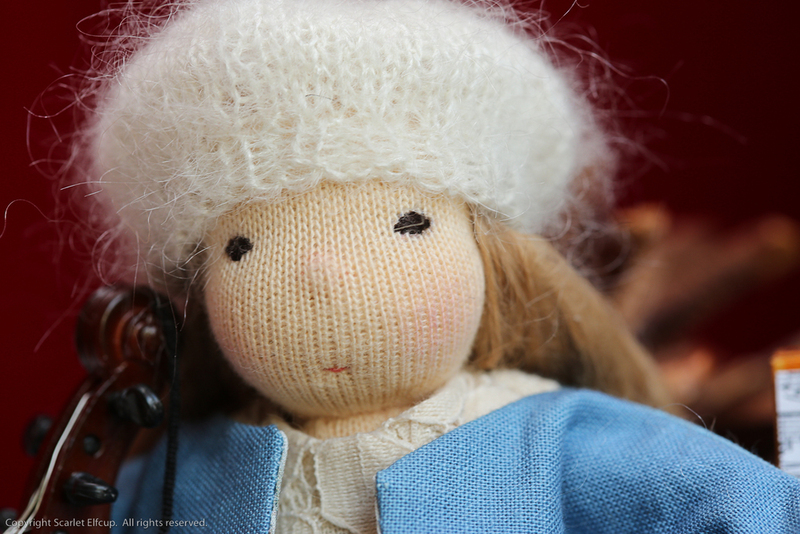 She also has a hand knit beret that she considers her lucky beret and she makes sure to attend every concert wearing this hat. Mirette was inspired by my love for music. There isn't much that I wished I had experienced differently in life...the good, with the not so pleasant experiences. To me...it's all good that we experience both spectrums and that we embrace the life that we have. However, there is one piece of life that I really really wished I had more of...and that bit is the knowledge to play an instrument. I love, love, love music and I don't think there is much in life that moves a soul more than music. Music to me, is one of the miracles of life. How do sounds come together to form this intangible, indescribable thing we call music that is so beautiful and can stir so much and so many emotions? It's truly amazing...music! Mirette is a Wee-Bee Mini Elfcup. She stands less than 6" (15 cm) tall. She is made with all natural materials. 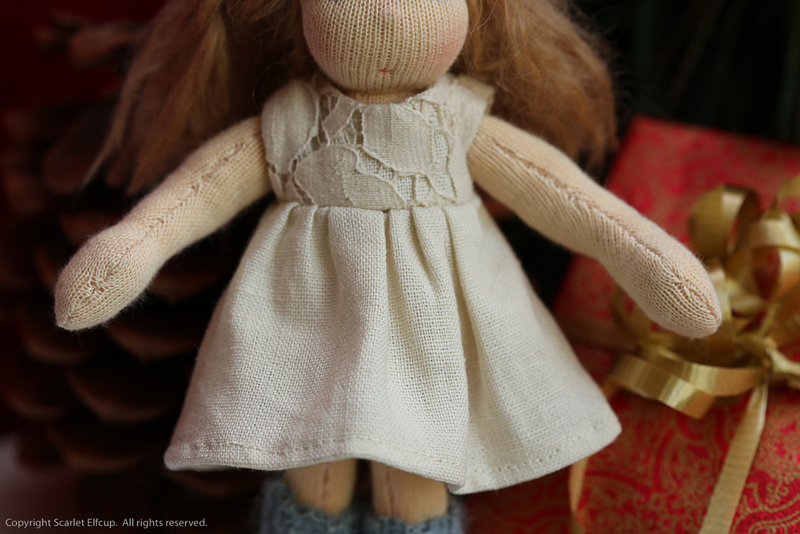 Her doll skin is made with premium quality cotton jersey imported from Europe. She is firmly stuffed with bio-wool made in Oregon. Her seams are sewn twice for reinforcement. 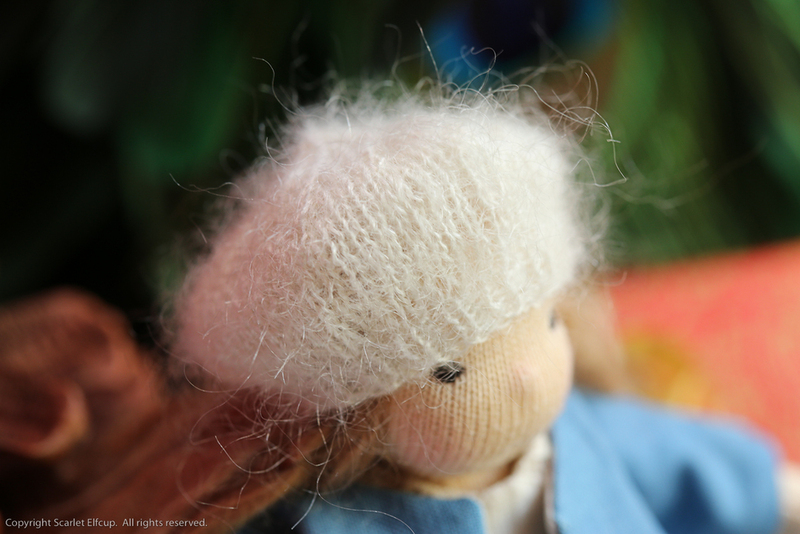 Her locks are made of wefted Suri alpaca, a luxurious, ultra-soft and silky fiber. 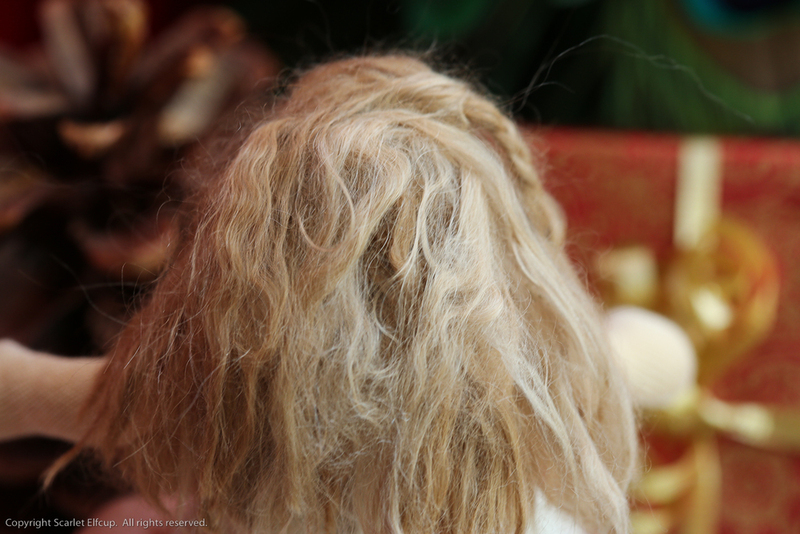 Suri alpaca has natural crimps and waves in the fiber, hence giving Mirette a full bodied, yet wispy and silky hair. Her hair can can be tied and styled lightly. She has embroidered facial features. Her cheeks, nose and various body parts are blushed with red beeswax. 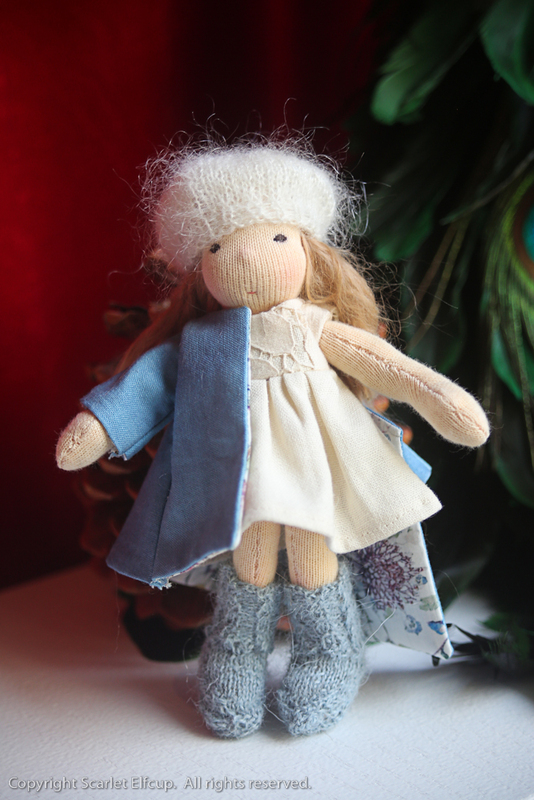 She is a sitting doll with sewn joints that are made flexible for easy movement and changing of clothes. She has a sweet belly button and a bum. Mirette comes dressed for her holiday concert. 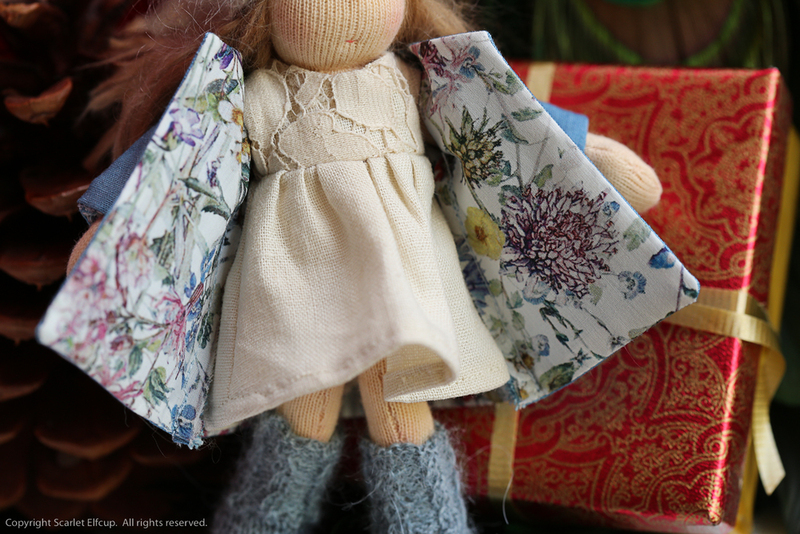 Her favorite blue coat is made of indigo hand-dyed cotton and lined on the inside with the most beautiful floral design by Su Blackwell (my most favorite paper sculptor artist) on Liberty of London fabric. The coat has a single pleat on the back. Her dress is made of a cream colored linen, lined on the top with a beautiful and high quality lace fabric. Her dress opens fully on the back with nickel-free hand-sewn snaps. 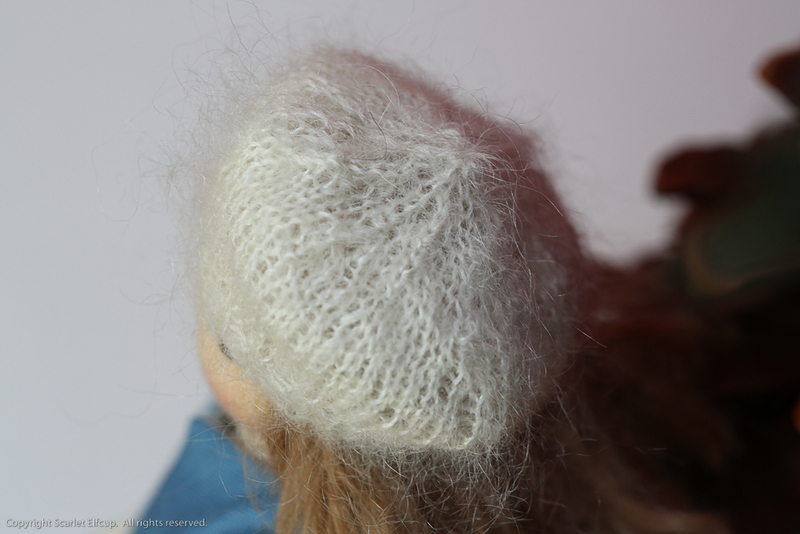 Mirette's lucky hat is a hand knit beret made from Rowan Kidsilk Haze yarn, a mohair-silk blended yarn. 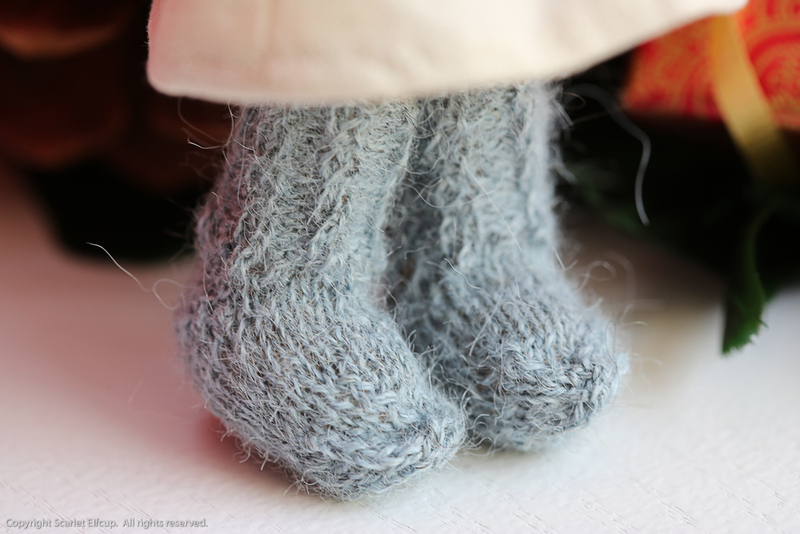 Her boots are hand knit using Isager 100% alpaca yarn. 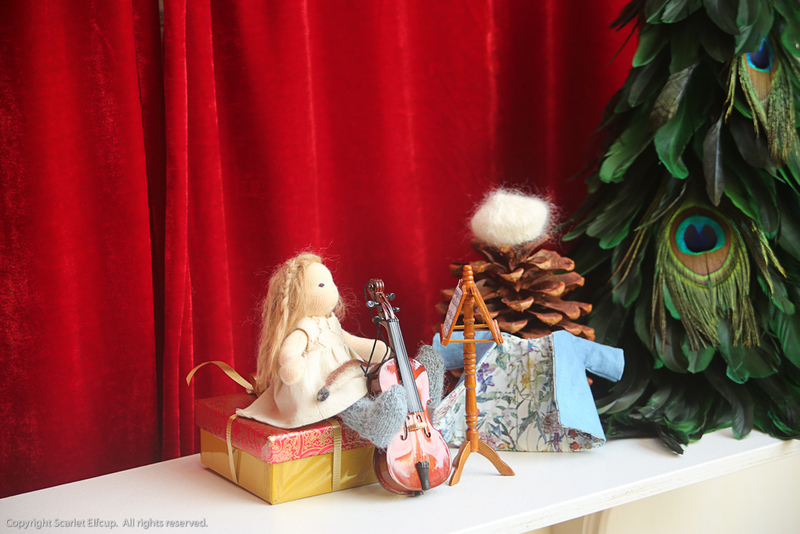 Mirette comes with a wooden violin that can be converted and hung as a Christmas ornament. 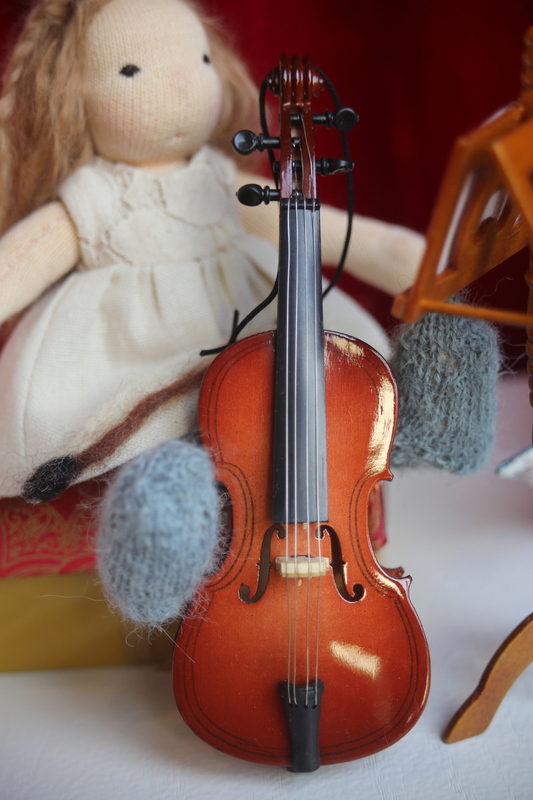 Her violin bow is made from wood and thread. Her music stand is made of wood and can also be converted to a Christmas ornament. The violin and the stand both measures about 5 inches (13 cm) long. Mirette is recommended for ages 4+ due to the nature of her delicate design and the small parts on her that may pose as choking hazards for children who still enjoy exploring with their mouths. 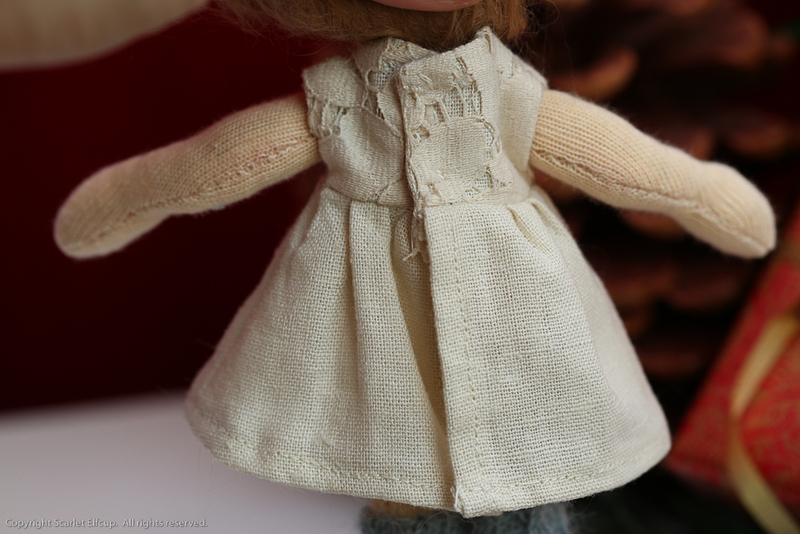 If you are interested in bringing Mirette home, she is now available in the Etsy shop.